Adventurous music lives! And that’s why you should subscribe to Progression magazine, the world’s foremost authority on art-rock and all subgenres of progressive music! Progression is a full-size quarterly magazine devoted to news, reviews, interviews and features covering a wide range of progressive music acts from around the globe. Our coverage scope includes: progressive rock, art-rock, progressive metal, symphonic, neo-classical, jam band, electronic, ambient, space music, world music, psychedelic, instrumental rock, math rock, avant-garde, fusion, acid jazz, experimental, pagan/medieval styles ... and even more! We cover the well-known "classic" acts such as Yes, Marillion, King Crimson, Mike Oldfield, etc. ; other relative household names a la Steven Wilson, Spock’s Beard, The Flower Kings, Anglagard, etc., plus countless others new to the scene. Each edition of the magazine exceeds 100 pages and showcases exclusive, in-depth interviews with progressive artists and bands. 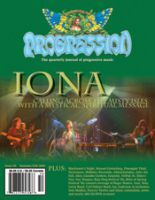 Past issues have featured Keith Emerson, Dream Theater, John McLaughlin, Iona, Jon Anderson, Annie Haslam, Ian Anderson, etc., plus many lesser-known, up-and-coming stars. Also included in each issue are dozens of album, DVD, book and concert reviews, plus insightful commentary from our knowledgeable columnists. All editorial material is compiled by professional journalists, photographers and musicians with many years of experience in progressive music. Progession began publishing in summer 1992. Many highly collectible back issues are still available.